GAINES TOWNSHIP, Mich. (WLS) -- A photo of a cake with a quirky decoration is going viral with its simple message: kindness matters. A Michigan woman says it all started last weekend when she asked a bakery employee at her grocery store to write a message on a blank cake for her, then quickly smiled and thanked her - without inspecting the handiwork. "After looking, I nervously laughed and headed to checkout - it didn't really matter to me that it looked so bad - I thought people would think it was funny," Lisa Aldrich wrote in a post on her Facebook page. 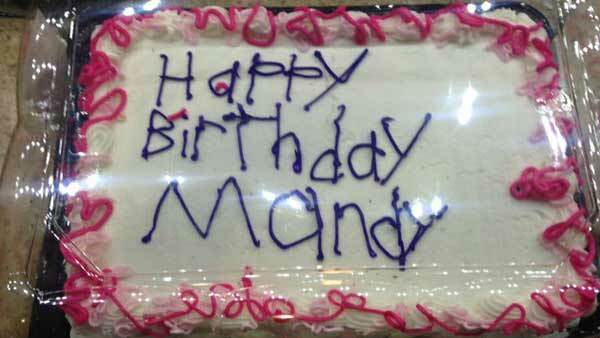 While in the checkout line, Aldrich wrote that several cashiers and a manager came over to see the cake. That's when she learned who was behind the message. "One cashier put her arm on my shoulder and said, 'The girl who wrote that has Autism. Thank you for smiling and thanking her - even though she's not supposed to write on cakes, you probably made her day,'" Aldrich wrote in her post. As of Tuesday night, the post has been shared more than 46,000 times. Aldrich said she has received over 100 messages from people all over the country who have loved ones with autism.